Countless forces have shaped the development of New York City, but the Grid System is not only one of its oldest, but also its most magnanimous. Lots of people write about the magnificence of the New York City Subway (and its map), and for good reason - it is one of the most complicated and extensive networks in the world. However, many miss out the foundations that underpins (and also predates) the underground rail network - the New York City Grid. The Grid Plan was an urban planning concept that was inspired by European city planners, from the grand boulevards of Versailles to the effort to revitalise the urban spaces of London devastated by the Great Fire. Modern day Barcelona is also another example of a great grid city.Planners also looked towards William Penn's plan for Philadelphia for guiding principles to lay out a future-proof plan as New York's growth start to quicken. While there are many divergent opinions on what good Urban Planning is, few would argue about how intrinsic the Grid System is to New York's identity and development. For this article, we'll delve into the origins of the 'World's Greatest City' and explore how the unrelenting forces of development and migration pushed city planners into adopting a plan that has now become synonymous with the city itself. The year 1624 marked the founding of 'New Amsterdam' - a small trading post at the tip of the island of Manhattan, at just about the same time bagels were invented in Poland. This naming convention was a common quirk amongst many unimaginative colonialists, leading to some incredibly inspiring names around the globe, from New Zeeland to Nova Scotia (New Scotland). This new settlement at the confluence of the Hudson and the East Rivers soon became the capital of the Dutch Settlement of the Americas which was called (you guessed it), New Netherland. However, despite the dominance of rationalist thinking and planning during the period, this new city wasn't planned for in an organised fashion. Nevertheless, the first full picture we have of the city comes from the 'Castello Plan', neither named after its creator (it was found in Villa di Castello in Italy) nor technically even a plan as it was more like a sketch of the existing settlement in 1660. From the plan, we can see that the city had not assumed any significant degree of importance on a level befitting a capital or even a fast growing city. The construction of a wall on the northern edge (right-side of the map) of the city, though in part due to the need to protect the settlement from 'barbaric' native American Indians, stifled the city's growth. In any case, we can also notice that the buildings in the city weren't exactly configured in a dense and space-efficient manner. Instead, we see small scale reproductions of sprawling European estates in what is a proto-urban planning effort - the beginning of New York's urban planning history. The plan however, does hold some sentimental value even if you're not a cartographer. For one, the aforementioned wall that used to separate the settlement from the rest of Manhattan was the origin of the now famous (linear) centre of American finance - Wall Street. Similarly, the current day Battery Park can trace its origins directly to the fort that appears on the Castello Plan - the now-defunct Dutch Artillery Battery. Finally, the dominance of boat travel during the period directly resulted in the creation of Broad St - named after the Broad Canal (you can't miss it) as it ran through the heart of the settlement. Apart from these physical structures, New York kept many naming decisions from their Dutch predecessors even though many of the buildings from the Dutch, British and early American era were destroyed by the three Great Fires of New York. Some of these naming conventions have even influenced choices made outside of the initial settlement area like Bedford–Stuyvesant in Brooklyn - named after Peter Stuyvesant, the last Dutch director-general of New Netherland. Through this, we see that early New York actually grew quite organically and took on names that evolved with the times. That being said, while the development of New York City before the Grid System was very much organic in nature, this practice did actually cease quite early on (before the 1911 Grid Plan) as city planners soon realised that a rational approach had to be taken to address how fast the city was growing. While we don't usually consider areas like the Lower East Side, TriBeCa and Greenwich Village as part of the modern NYC Grid System, there was actually some form of structure imposed on the development of these areas of the city (if you look closely). If you look up these neighbourhoods on Google Maps, the Lower East Side, bounded by E Houston St and Grand St is organised in some grid-like rectangular pattern. Though less organised, the same can be said about TriBeCa and Greenwich Village though those neighbourhoods have been shoehorned into a tighter, more vertical space. The reason for the divergence in the shape and size of these grids? They were primarily the result of efforts by private (and non co-operating) landowners to organise 'their sections' of the city in a more systematic manner. Interestingly enough, these areas of the city were chosen because of their proximity to either the Hudson (where cargo and people moved) or downtown Manhattan (where the centre of commerce spun). Through these initial steps towards a logical organisation of urban sprawl, New York City possessed the early ideas of what it meant to be a planned city - but it was not until 1811, when the pressing need for a uniform system of urban planning arose, that the idea was put into practice. For the most part, the Commissioners Plan of 1811 was conceived to ensure that New York was imbued with modern urban planning methods, and was thus able to keep pace with major European and American cities. Was it successful? We think so. The base plan for the grid was conceived by the City Commissioner and released in 1811, calling for the institution of a massive (but organised) grid system that stretched from Houston St (pronounced HOUSE-ton) in downtown Manhattan to 155th St in Harlem. It's hard to understate the magnitude of the Commissioner's vision especially when you realise that the plan called for the organisation of space about 5 to 6x of the existing city, which meant that these planners were (rightfully) confident that the city was about the continue its unprecedented rates of growth. Indeed, New York City would probably look very different (and perhaps less vibrant) today if not for the Commissioner's foresight. Apart from the bold vision of the plan, one other unique aspect of it was its fundamental rejection of inefficient 'public areas' and spontaneous road construction - phenomena that would normally have resulted from organic city growth. Instead, the prioritisation of a utilitarian approach to organising the future infrastructure of the city was preferred. A substantial widening of the city's existing roads for the growing vehicular traffic (bicycles and horsecars) in the city was also another goal of the plan as older parts of the city started to get choked with traffic. Fundamentally, we think that this structured and logical approach to addressing simple issues like moving people and cargo was what underpinned the future industrial successes of New York City. Similarly, a fundamental reorientation and rethinking of the role of the city government took place as a result of the plan's implementation. Not only did the city have to greatly expand its bureaucratic capabilities to manage the mass of information and data coming in from land surveyors, it also had to set up new legal mechanisms like Eminent Domain and Courts of Appeal in order to seize private property for the development of roads. This however did not proceed like how collectivisation occured in the USSR as American capitalism, even with all its fervour, demanded fair treatment of private property, especially since the support of New York's richest citizens and patrons was paramount to the city's success and survival. Consequently, not only did the hard infrastructure of the city get laid out in the proceeding decades of the 19th century, the legal, political and economic structures of the city started to strengthen. Arguably, these public-private 'innovations' in city development also helped other American cities gain a strong footing. Side note: even though the plan demarcated Houston St as its beginning, the full NYC Grid System only kicks in as a complete arrangement at 14th St. This is the result of the aforementioned private developments surrounding Greenwich Village, and that these 'end' at 14th St. In any case, the 1811 plan laid out the construction of avenues that were to run North-South, which were to be complemented by streets made to run perpendicular, intersecting with these avenues right throughout the city. It is for this reason that in classic New York parlance, people refer to journeys across the Manhattan Grid as being either Uptown, Downtown or Cross-town. As the city's population started to grow rapidly, the lack of public spaces started to put a strain on living standards as the constant noise of the city started to overwhelm its inhabitants. As the only existing 'public spaces' were cemeteries (people were already drawn to them as quiet havens), city planners decided to take action. After extensive surveys, they decided upon a plot of land bounded by 5th and 8th Ave, which was comprised of space from 59th to 110th St. This was a huge undertaking to say the least, but in the spirit of the era and with a view to future-proof the city (much like the 1811 Plan), the plan was accepted, and construction proceeded until its completion in 1857. The presence of Broadway predates even the Dutch settlement of New Amsterdam, as it started out as the Wickquasgeck Trail laid out by Manhattan's Native American inhabitants. As such, the Plan of 1811 did actually include provisions for the road even as its heretical route caused significant amendments to be made to the original plan. Because Broadway's diagonal dash across Manhattan's grid was accommodated within the grid system, interesting 'triangular' plots of land popped up across the borough as Broadway interscted with regularly spaced avenues and streets. The best way to quickly find these is to look at the city's many 'squares'. Union, Madison, Herald, Times and Verdi Square all exist because of Broadway's awkward crosstown march. One other famous intersection occurs at the confluence of 5th Ave, Broadway and E 22nd, which has given the city the famous Flatiron Building, built atop a unique triangular plot of land. Over the years, the city has been decently flexible with the grid system, allowing for changes to be made. Perhaps the most prominent revision (apart from Central Park that is) could be considered to be the inclusion of Madison, Lexington and Park Aves into the overall New York City layout. While none of these three new avenues were part of the original Commissioners' Plan, Madison and Lexington were carved out between existing ones (5th & 4th for the former, and 4th & 3rd for the latter) in an effort to boost the property value of the buildings around it due to the enhanced connectivity of these new roads. Fourth Avenue was also renamed Park Avenue in 1959 due to the infamous 'park' that now sits in the middle of its divided North and Southbound lanes. The reason for this divide? The old New York and Harlem Railroad used to run along the avenue through an open cut. 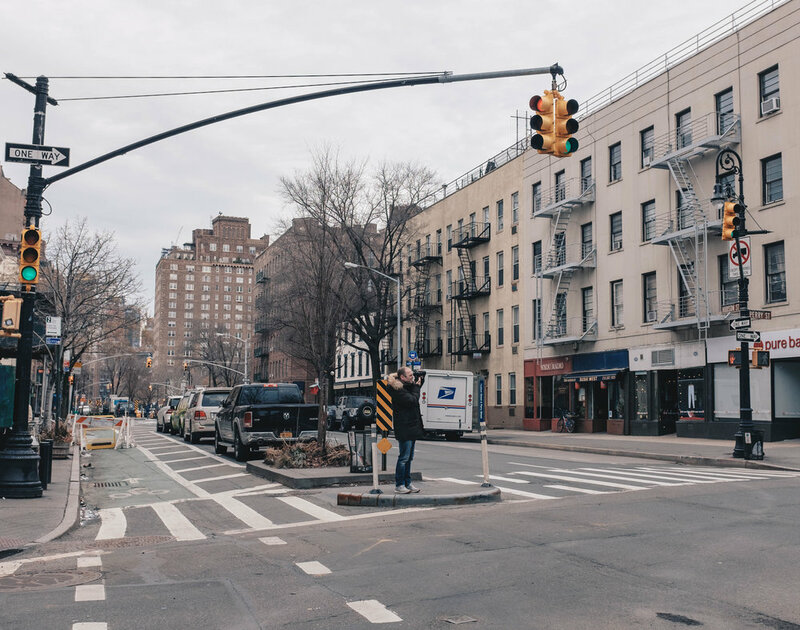 10th Avenue was also renamed Amsterdam Ave to inject an 'old-time nostalgia' to the area as landowners in the Upper West Side wanted to augment the 'cultural quotient' of their slice of the city. Lastly, the huge freeways of FDR Drive and the West Side Highway were added to the city as a means of supplementing the total traffic throughput of the city. This was achieved through a horizontal expansion out of the original boundaries of the Commissioners' Plan via an extensive reclamation effort. As the city began to fill up the various plots of land apportioned by the grids, developers quickly realised that the only way to maximise space was to build up instead of across - a concept that wasn't as critical to the development of other cities. As the grid system was only able to dole out small parcels of land between its avenues and streets, developers in New York began to unveil impressive designs for skyscrapers that were to increase land space through vertical means. It is indeed for this reason that New York City, alongside Chicago, became progenitors of a worldwide fascination with skyscrapers. The grid system has one important benefit for ease of navigation - its regularity. As streets and avenues are named according to numbers, trying to get to your destination requires you to just memorise the closest road intersection. Want to go to the Empire State? Just tell your taxi driver/friend to head to the corner of 5th and 34th. That's way easier to understand than saying that the Teatro allo Scala is along Milan's Via Filodrammatici. In New York, area codes are also pretty much irrelevant. Additionally, the regularity of the grid means that the flow of traffic along streets and avenues can be omnidirectional yet easily predictable based on whether their assigned numbers are odd or even. Take a ride on any of New York's bus tours and you'll know what we mean. As NYC started constructing subway lines (not to be confused with the New York Central Railroad), the Grid Plan aided in greatly simplifying the process of naming and planning for new stations. In essence, the regularity of the grid means that rail lines can simply run along the avenues and name their stops according to the streets that they stop at, instead of using arbitrary nomenclature. That being said, there is one downside. For those who struggle with navigating the network, it can be confusing to learn that there are 4 sets of 42nd, 34th and 14th Street stations. Hint: This is because many subway lines in Manhattan, though they stop at the same street, are all running along different avenues. Similarly, the L train runs along 14th St and instead names its stops according to the avenue it stops at. By extension, many point out that the grid fails to allow for the retention of natural fountains, woodlands, fields or other naturally occurring features especially in the city's core areas. As we have also mentioned, it didn't even include provisions to build public parks or spaces. Nevertheless, the Plan of 1811 did eventually drown out its detractors as many have come to realise its hidden flexibility. For example, the addition of new parks, open spaces and roadways have been achieved even though these efforts came about many decades after the plan's provisions were fulfilled - something quite impossible to do in the heart of most organically grown cities. The modern trend of constructing multi-use buildings has also overturned views that the city's grid plan tended to artificially segment parts of the city from each other. Nowadays, with the dominance of automobiles, some also postulate that New York's roads are too narrow to accommodate the current deluge of traffic, and that because of the regularity of the grid system, it is now virtually impossible to relieve the city. We think that the New York Subway address this challenge head on as to this day, whilst New York is still one of the world's most congested cities, the problem could have been even worse. If (for some reason) you've been able to sit through an entire article that just rambles on about the intricacies of grid cities and urban planning, congratulations. The New York City grid system (and the Plan of 1811) represented an era of American history that was replete with excitement - the expansion of a fledgling nation, the development of revolutionary technology and perhaps above all, a unshakeable expectation that the future held limitless possibilities for humanity. Though there is probably a never ending list of nitty gritty details that one could go into when recounting the impact of the Grid System on New York City, we think that the ones highlighted here are probably its most salient. And so, the next time you encounter the 'Grid City', wherever you may be, perhaps you'll more fondly remember the Master of the Grid and the city that popularised it. Love what you're reading? Follow us on Facebook to keep up with all of our articles on travel.